Today, realism and coherence are highly searched qualities in agent’s behavior; but these qualities cannot be achieved completely without incorporation of emotions. 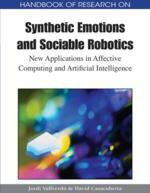 This chapter shows a model for emotional representations in intelligent agents. The model is based on the cognitive appraisal theory of emotions; this theory affirms that stimuli are processed by a cognitive mechanism that determines what emotion to feel. It is also based on the Aaron Sloman’s research where positively and negatively affective states are exposed, as well as, on the theory of basic emotions. The model tries to define an emotional representation data structure for intelligent agents. It also defines the emotional behavior mechanisms when a stimulus is processed, as well as, emotional interaction mechanisms. This chapter is presented in five sections: Introduction, where the topic is presented. State-of-the-Art, where it is introduced a review of emotional studies in psychological areas, as well as, computing areas. The Model Definition section, where a detailed model structure and mechanism are introduced. A fourth section describing the future trends and researches and finally the chapter conclusions. The beginnings of the emotional studies could be set back in Athens where Socrates proposed the inalterable human behavior principles existence, among them, the good feelings like ethics. In modern times, Charles Darwin conducts studies about emotions expression in humans and animals (Darwin, 1899). Darwin’s studies are centered in the way humans and animals express their emotions and not in mechanisms for generating experience and processing emotions. Darwin’s studies take for granted the existence of emotions in humans and animals, introducing in an implicit way the basic emotions idea. According to him, there is a set of emotions which is present in any human being, since its birth, no matter ethnics or social conditions, affirming that these basic emotions are present in high level animals, too. Emotion Persistence: This represents the agent’s tendency to continue experiencing an emotion once finished an exciting stimulus. Emotional Stimulus: Direct emotions stimuli are the result of the sensorial stimulus processing by the cognitive mechanisms. When an event occurs in the environment, sensorial stimuli are received by the agent. The cognitive mechanisms process this stimulus and generate the emotional stimulus for each one of the emotions to be affected. Emotion Susceptibility: This represents the ease of increasing an emotion value. Susceptibility can be considered as the agent disposition to experience an emotion with greater or smaller intensity. This means that agents with a greater susceptibility in an emotion will reach greater values than an agent with smaller susceptibility, with the same stimulus. Emotional Interaction: The emotional interaction mechanism describes the way emotions affect each other. Emotions can have an augmenting or diminishing effect over other emotions. When an emotion is excited, this one could affect another emotion behavior, and this affection is what we call emotional interaction. Emotional Stabilization: Emotional Stabilization is a gradual process that occurs in the emotion when a stimulus is processed. This process tends to set the emotion equal to the emotion normal value through the increment or diminish of the current value. When a stimulus is processed for the emotion, the emotion value changes, if no further stimulus are received for this emotion its value will be gradually affected to become equal to the emotion normal value. In order to achieve this, the model uses the EMOTION_PERSISTENCE which represents the number of iterations that should pass until increment or diminish emotion value in one (1), to make it close to the NORMAL_EMOTION_VALUE. Even when the increment or diminish is equal to one (1) when some iterations pass, on each iteration the EMOTION_VALUE should be modified in a fraction depending on the EMOTION_PERSITENCE value. Sensorial Stimulus: The sensorial stimulus are a set of values related to an event that the agent is able to read, perceive through its perception mechanisms and can interpret based on the received values, although the agent not necessarily does know the exact stimuli. Autonomous Emotion Development: This is the capacity of an agent to develop its emotions, according the received experiences, with a minimal human direct intervention.